Endangered Western Hoolock Gibbon !!!! They always traverse from branches to branches in high canopy and most of the times it gets difficult to have a proper background. A Female Gibbon and her Baby. Very nice behavior shot showing the baby cliched to its traversing mother high above the ground. The background habitat is fine. 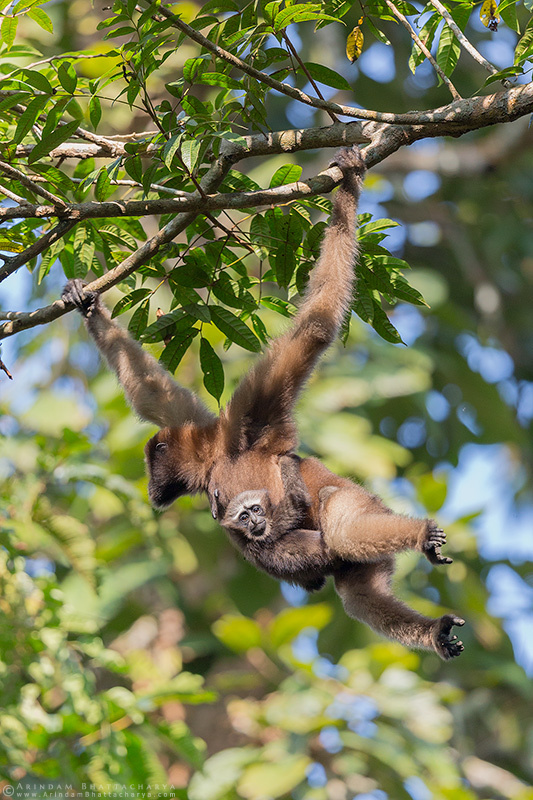 The high tree canopy is where they spend most of their time, so its the right setting and background for this agile mother and her clinging infant, Arindam. A lovely behaviour capture! Nice open view here !!! Great job on this capture ! Background is entirely appropriate- in fact, it is part of the story. Wonderful to see the baby clinging to Mom and that fine action in the branches. Excellent capture Arindam, the look on the baby's face is priceless.